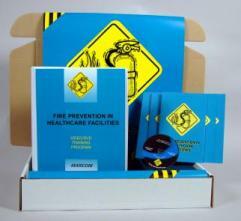 MARCOM's "Fire Prevention in Healthcare Facilities" Safety Meeting Kit looks at how fires in healthcare facilities start, and what can be done to prevent them... as well as what employees should do in case of a fire emergency. Among all the safety problems employees can encounter, fire can be the most frightening. Every year fires in healthcare facilities cause millions of dollars in damage and result in numerous employee injuries... and fatalities. Yet many employees do not realize how their own actions can contribute to the risk of fire. Materials in the kit include a video program, five motivational posters, and 30 employee booklets. The posters in the kit emphasize the importance of fire prevention. The video program and employee booklets include information on common causes of fires in healthcare facilities, the concept of "flashpoint", preventing fires, fire extinguishers, handling flammable materials, evacuation and other employee responsibilities, first aid, and more. The video program in the kit comes with a comprehensive leader's guide, reproducible scheduling & attendance form, employee quiz, training certificate and training log.